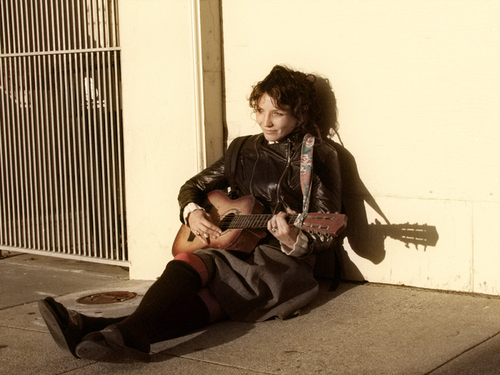 She was sitting on the sidewalk, strumming her guitar. It was about an hour to sunset. The golden twilight cast a shadow on her guitar, silhouetting it against the garage door behind her. She looked up at me with sad brown eyes, hair curling around her forehead. She said it would be okay if I took her photo. I asked if I could email her a copy. "No," she said dreamily, and bowed her head again, strumming. Lost in her thoughts. Beautiful melancholy girl.